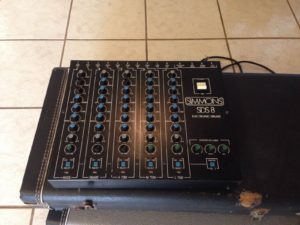 “Quite rare vintage Simmons MTX 9 drum sound module with MIDI. Tested , all channels works fine.Sound can be triggered from triggers or MIDI. 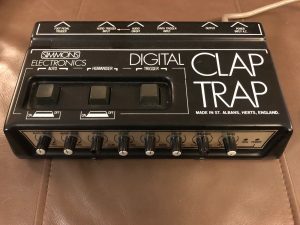 SIMMONS CLAP TRAP “RARE VINTAGE” Mint Condition. This machine needs no introduction. 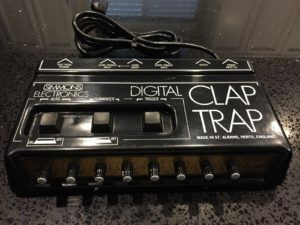 Everyone who knows “clap machine” knows that the “Famous Clap Trap by Simmons is the best clap trap ever built. You can trigger it, play it, trigger it from a microphone, use it in the studio and more. “NEW OLD-STOCK IN ORIGINAL BOX WITH ORIGINAL MANUAL. AMAZING HISTORICAL PIECE PERFECT FOR SYNTHESIZER / DIGITAL COLLECTION OR FOR STUDIO USE. PICTURES SAY IT ALL. 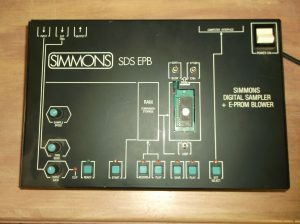 This Simmons drum module has been tested and is fully functional. There are some cosmetic signs of wear and rack rash on the chassis, does not effect the performance of the unit, great vintage piece. Each can be controlled with sensitivity level & output level. Each drum also has it’s own output (if you want to pan individually into your DAW), or you can run mono or stereo out of master outputs. Save programs/patches. Trigger LEDs for each drum. Drums can be triggered by a sequencers, trigger pads, etc. The item pictured is the one you will be receiving. “Used and as far as I can tell working. All modules work and produce sound. knobs all work as they should.I have only used the synth input to trigger them with the audio out of a drum machine. I have no pads to test the pad inputs. a number of the knob tops are missing. The mixer section has three broken knobs but the shafts can still be turned. No pads included in sale just the unit. “Like the title says extra clean works perfect. Es handelt sich um den Kult aus den 80gern, das Simmons SDSV mit der, aus meiner Sicht, besten Bestückung die man haben kann. “The SDS7 was the first Simmons offering a digital sound source beside the famous and well-established analog sound generation. Both “worlds” can be mixed. Each of the up to 12 modules carries an eprom with an 8 bit sound sample which can be edited with the well known and succeful analog filters. These sounds are taken from a Simmons library or can be sampled and burned with the Eprom Blower EPB. The filter settings can be saved in up to 99 kits. The first 16 can be quickly selected by the selector pad. – Cards include: Bass, Tom, Tom, Tom, Snare, Hi Hat, Cymbal, Cymbal. 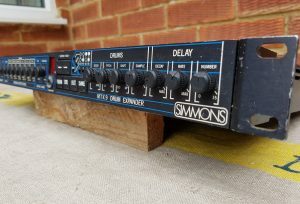 ” Vintage Simmons SDSV Analogue Drum Brain with 3 Drum Pads. This is a shortloaded SDS5 with 3 Tom modules and one Snare module. The Snare and 2 of the Tom modules are 100% functional; HOWEVER, one of the Tom modules has a bad pot. The 3 presets on this module work fine, but when you set it to be adjusted via the panel pots, it doesn’t work. “Leider muss ich mich von meinem geliebten Simmons SDSV (SDS 5) trennen. 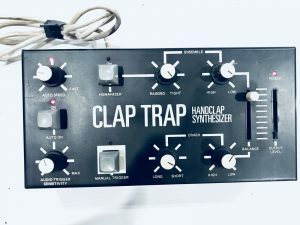 Sie bieten auf ein klassisches analoges E-Drum-Modul vom britischen Kult-Hersteller Simmons. Das Gerät ist voll funktionsfähig und optisch in gutem Zustand, mit ein paar kleineren Kratzern hier und da. 3 Potikappen fehlen.